The official weigh-in for Saturday’s World Super-Middleweight unification clash between WBC world champion Badou Jack and IBF world champion James DeGale took place on Friday in Brooklyn, NY. The official weights for the entire card are as follows. Main Event: WBC/IBF World Super-Middleweight Championship Unification Bout – 12Rds. Badou Jack (WBC champion) 167 1/4lbs. vs. James DeGale (IBF champion) 166 1/2lbs. IBF Jr. Lightweight world championship – 12Rds. Jose Pedraza (champion) 129lbs. vs. Gervonta Davis 129lbs. WBO Women’s Jr. Featherweight world championship – 10Rds. Amanda Serrano (Champion) 120 3/4lbs. vs. Yazmin Rivas 121 1/2lbs. Vacant WBC Silver Middleweight championship – 10Rds. Ievgen Khytrov 159 1/2lbs. vs. Immanuwel Aleem 158 1/2lbs. Adam Kownacki 257 3/4lbs. vs. Joshua Tufte 267 3/4lbs. Thomas Dulorme 145 3/4lbs. vs. Brian Jones 144 1/2lbs. Kenny Robles* 144lbs. vs. Latorie Woodberry 141 1/2lbs. Julian Sosa 141 1/2lbs. vs. Gabriel Solario 143 1/4lbs. Maxito Sainvil 145 3/4lbs. vs. Noel Murphy 146 1/2lbs. Jack vs. DeGale takes place Tonight (Saturday, January 14th) at the Barclays Center in Brooklyn, NY. 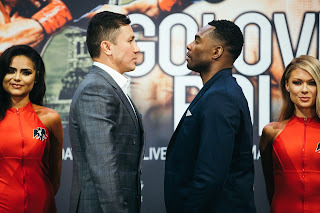 The fight card can be seen in the United States on Showtime with the main card headlined by Jack vs. DeGale airing on the main Showtime network at 9:30PM ET/6:30PM PT Check your cable/satellite provider for time and channel in your area. The main card will also be available live on the Showtime and Showtime Anytime streaming apps. Showtime Sports will also air a portion of preliminary bouts headlined by Serrano vs. Rivas beginning at 7PM ET/4PM PT on Showtime’s Showtime Extreme network. For more information on Showtime Sports, Showtime Boxing, Showtime, Showtime Anytime, and for availability of Showtime Extreme in your area please visit: www.sho.com. In the United Kingdom and Ireland the card can be seen on Sky Sports 1 beginning at 2AM (Sunday, January 15th Local UK Time) with a replay airing later in the morning on Sky Sports 3 at 10:30 AM. For more information please visit: www.SkySports.com.